Portland, Oregon based KEEN, Inc is a footwear manufacturer founded in 2003 by Martin Keen and Rory Fuerst. The first product, the KEEN Newport, was a sandal with a thick black rubber toe protector. They found an initial market in sailing and now offer shoes for many outdoor activities as well as casual footwear. Their products are carried in retail locations such as REI, Dicks Sporting Goods, and Nordstrom. 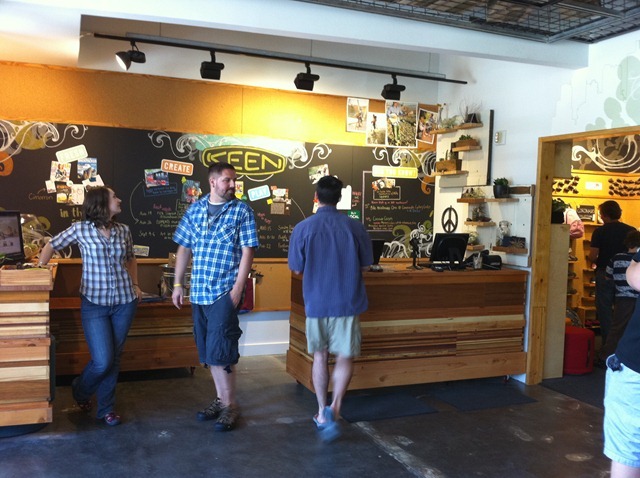 In August, KEEN opened their first branded retail store in the trendy Pearl District of Portland, Oregon (where I happen to live). 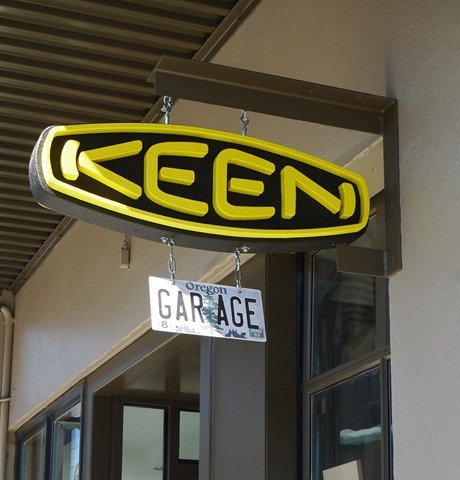 The 900 square-foot store called “the Garage” is at at 926 NW 13th Ave, downstairs from the KEEN Corporate Headquarters. The store has a number of cool design elements that feel somewhat quirky and unorthodox while still being functional. They make liberal use of recycled items, re-claimed materials, scrap metal, etc… which is very much “in brand” for Keen. A shoppers first impression is that this is a high-energy, fun place to shop. The overall customer experience is very favorable. 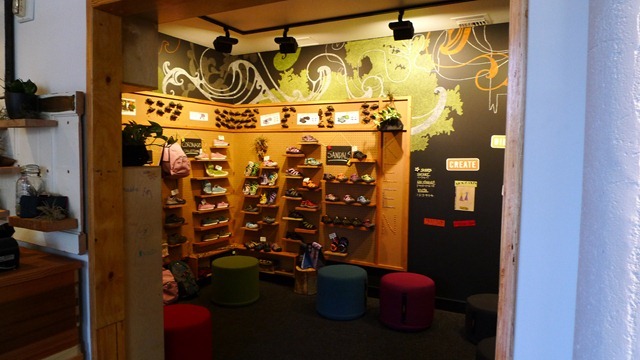 The primary selling area dedicates two walls to merchandising footwear, and a third wall features a vintage bleacher system for shoppers to sit down and try on shoes. 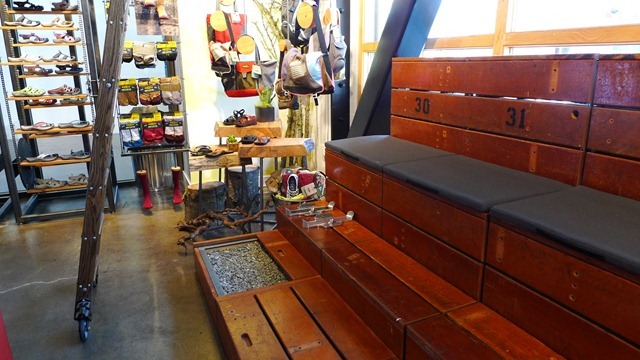 Custom drawers pull out of the bottom row of bleachers, and are filled with various walking surfaces (logs, pebbles, etc…), to allow shoppers to test their traction. The drawers are probably too small for a really functional test, but they send a clear message to the shopper “Our products are built to go off road”. The signature visual element of the store, is a mechanical rotisserie shelving system used for merchandising the footwear. By spinning a wheel at each shelf, shoppers can scroll through a variety of products. This is a clever solution to the common “SKU Density” challenge that most footwear merchandisers face. Put very few SKU’s on display (low SKU Density) and shoppers perceive that each SKU is very high quality (think Prada), put many SKU’s on display in a small area (high SKU Density) and the display reads to shoppers as a good value (think Costco). So a manufacturer like Keen wants to fit lots of SKU’s in a small retail space, but still retain the quality perception of a low SKU density. The rotisserie shelves achieve both goals. They also do a great job of enticing shoppers to interact with the store… it’s difficult to resist putting your hands on those wheels and giving them a spin! A smaller alcove merchandises children’s products and includes a miniature version of the bleachers and funky furniture for kids. Clearly the store is intended to be a laboratory for the corporate office, more than it is a template for future KEEN branded stores. 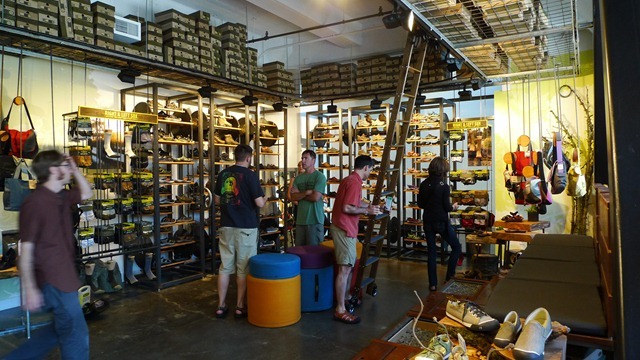 Operating the store will give the product managers at KEEN a valuable new connection to their end-users, and will give the merchandising team valuable feedback about how people want to shop for their products. While the customer experience is great, the store was clearly not designed by people with a lot of operational retail experience. All the live inventory is stored in rafters over the customers heads. Forcing staff to frequently climb up the library style ladder to fetch product for customers. Inevitably, some boxes will be knocked to the back of the rafters and be out of reach from the ladder. I suspect that store management was hired after the store was designed, and that there will be some learning’s about how to make the store more functional for employees. While I have great empathy for the staff that have to work in the store, if you’re going to make a design mistake, it’s far better that the employee experience be compromised rather than the customer experience. And the staff does get to come to work every day wearing sandals! All in all, the KEEN Garage does a great job representing the brand and is a welcome addition to the retail ecosystem of the neighborhood.